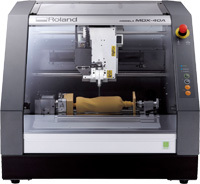 A friend of mine bought himself a Roland MDX-40A desktop milling machine, with the optional ZCL-40A rotary axis. It was from an E-bay seller. It comes with a large assortment of tools and accessories. But they all came in a bag. Hard to find small items, and not very well protected. As one of our first large projects on the machine, I designed a storage case to hold all the accessories.